How to Keep the Fire Burning! Father Pavone, who has been engaged in the battle against abortion for 40 years, turns his anger at the slaughter of thousands of innocents every day into energy for battle. Anger is energy. If you turn it in on yourself, it becomes depression. If you let it out in an uncontrolled way, it becomes destructive. Instead, you must channel it, harness it, under God's guidance, and direct it towards your work for life. The guidance of God in channeling your anger will assure that the activity it leads to is always non-violent and a life-giving blessing to others. 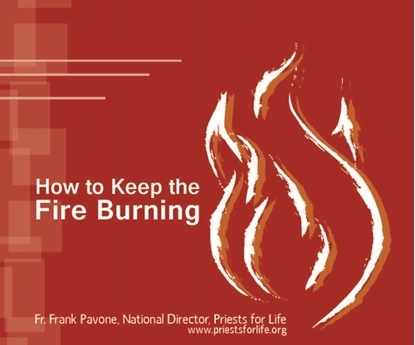 In "How to Keep the Fire Burning," Fr. Pavone gives advice on how to draw energy from others engaged in the battle, how to use the outrageous claims and tactics of the pro-aborts to turn the tables and how to learn from the example of others throughout history who have dedicated themselves to fighting grave injustice. Read about the struggles and triumphs of St. Paul in the Acts of the Apostles. Read about William Wilberforce and Dr. Martin Luther King, Jr. and numerous others. Read not only their words, but study their actions and their strategies and the movements they led. You will be encouraged and energized. "How to Keep the Fire Burning" is designed as a helpful tool that people waging the battle for life can turn to whenever they need encouragement or advice. This Advent and Christmas season, whether you are a preacher or simply a Christian who likes to meditate on the deeper meaning of these special times of year, you will enjoy reading "Christmas for the Unborn.” These reflections look at unborn children, and our duty to protect them from the violence of abortion, through the lens of the various theological, historical and spiritual dimensions of Advent and Christmas.